Blackpool boss Gary Bowyer has paid tribute to Jim McAlister, describing him as a “fantastic example” for all the youngsters at the club. The experienced midfielder has stepped up his recovery in recent weeks and is nearing a return to action in the New Year. It comes after the 32-year-old suffered a fractured tibia during the 1-1 draw against Colchester United at the start of February. 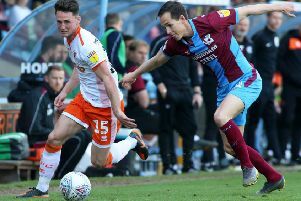 Bowyer said: “Jim has stepped up his training this week and has been a fantastic example for all the younger ones in terms of his passion and desire. “He’s a fantastic example because, with the run of results we are on at the moment, he’s hurting more than anyone and he’s not even been involved. “So he’s doing ever so well so we just need to be careful with him for these final stages. “We’re looking into the New Year but how far into that New Year we’re not quite sure yet. We’ll just have to monitor it week by week. “If you would have seen him running last week, he still had a limp. McAlister is far from Blackpool’s only fitness concern at the minute, with Kyle Vassell, Mark Cullen and Ollie Turton all out of contention for Pool’s festive schedule. But the Seasiders were given a boost last week with the return of Curtis Tilt to their backline against Shrewsbury Town. “The main concerns for us at this moment in time are Kyle Vassell and Mark Cullen,” Bowyer added. “Everybody else came through last weekend bar a few bumps and bruises but everyone is fit and well and ready to go again for Charlton. “Ollie Turton is OK. He’s not going to make Saturday but he’s getting better that’s for sure. “He’s in a position where he’s running a lot freer, but it was just an innocuous challenge in training that caused it. Unfortunately it’s turned out to be more than we initially thought. “Curtis is fine. He’s just got to keep producing the performance levels. “It’s no surprise to me that when we got that partnership back of him and Clark (Robertson), we limited a team who is sitting second in the league to one shot on target. Unfortunately, that one shot went in.